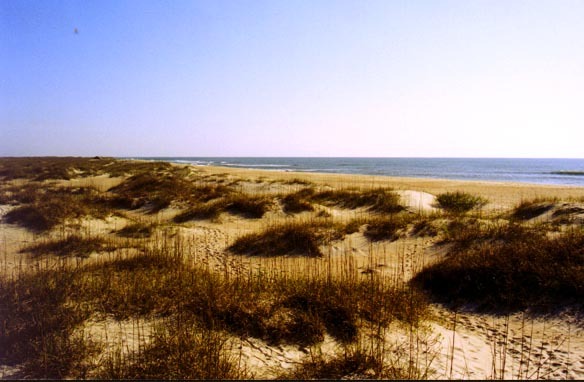 Cape Lookout National Seashore stretches along the barrier islands of North Carolina for 55 miles. This National Seashore was established to protect the dunes, sand beaches, and important bird-migration paths of this fragile ocean environment. The islands along the coast of North Carolina are called the Outer Banks. Sculpted by wind and waves, these sand islands absorb the sometimes violent energy of the Atlantic Ocean. The islands form a calm and protected waterway for ships between the islands and the North Carolina coast. There are three distinct ecological zones in the islands of the North Carolina Outer Banks. These zones are the ocean, the shoreline, and dunes. Each zone is home to different kinds of plants and animals. Cape Lookout National Seashore is home to a scenic lighthouse. For more information about Cape Lookout National Seashore, visit the U.S. National Park Service Internet page at www.nps.gov/calo.